Narrative realism in picture making has been a constant—not just through eight hundred years of Western art, but through the entire history of humanity’s creative efforts, from the earliest cave paintings and frescos on the walls of ancient Egyptian tombs to today’s published imagery for print, animation, and gaming. 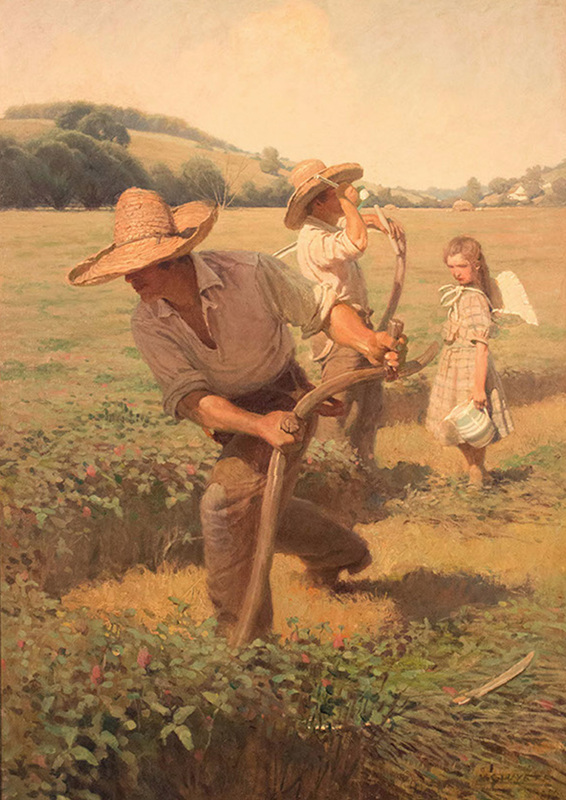 With irrefutable evidence on display, Keepers of the Flame: Parrish, Wyeth, Rockwell and the Narrative Tradition, opening on June 9, will shed light on the unbreakable thread connecting American illustration and legendary artists Maxfield Parrish, N.C. Wyeth, and Norman Rockwell to the roots of European painting through the long line of teachers, who have, through the centuries, passed along the wisdom, knowledge, and techniques of the ages to the next generation of creators. At the heart of this exhibition are Parrish’s lush fantasies, set in the timeless fairytale landscapes of his imaginings; Wyeth’s exuberant compositions and unforgettable characters, which breathe life into classic literature; and Rockwell’s humanistic portrayals, filled with humor and insights, for the nation’s most popular publications. 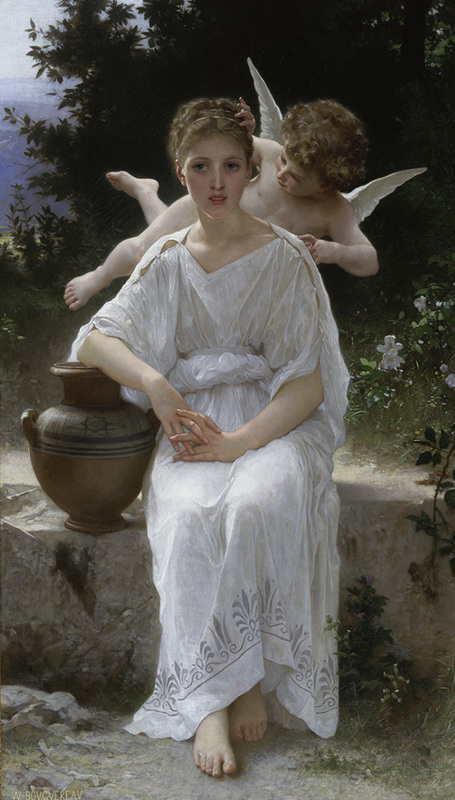 Curated by Dennis Nolan, an award-winning illustrator and professor of art at Hartford Art School, University of Hartford, the exhibition featuring more than 85 works by American and European masters spans five hundred years, tracing the student to teacher lineage of three Golden Age illustrators to their artistic forbearers in the Italian Renaissance. Paintings intended for a broad clientele, whether church or state, private collectors or public entities, transcend their original purpose to through the art of visual storytelling. Narrative paintings inspired by religious, mythological, allegorical, and literary sources, painted with academic precision, accuracy, and beauty, will be on view. This unbroken line of pupils and their mentors includes artworks by great American painters and teachers, Robert Vonnoh, Thomas Anshutz, George Bridgman, Henry Siddons Mowbray, Howard Pyle, and Thomas Eakins, their paintings on display next to the work of mainstays of the French academies of the 19th century, Jean Leon Gerome, William Bouguereau, Paul Delaroche, Henri Lehmann, Mark Charles Gleyre, and more. The lineage continues, following the teaching of principles of narrative picture making past Rococo, Baroque, and Renaissance masters to the workshops of Florence, Italy, the birthplace of Western painting. Artwork from 1400 to the mid-1960s, in the galleries and documented in a richly illustrated catalogue, reveals the ways in the keepers of the flame have ensured the passage of centuries old traditions from one generation to the next through time. Crystal Bridges Museum of American Art, Bentonville, Arkansas, 2006.71. Sponsored in part by Dena M. Hardymon, TD Bank and the Dr. Robert C. & Tina Sohn Foundation. 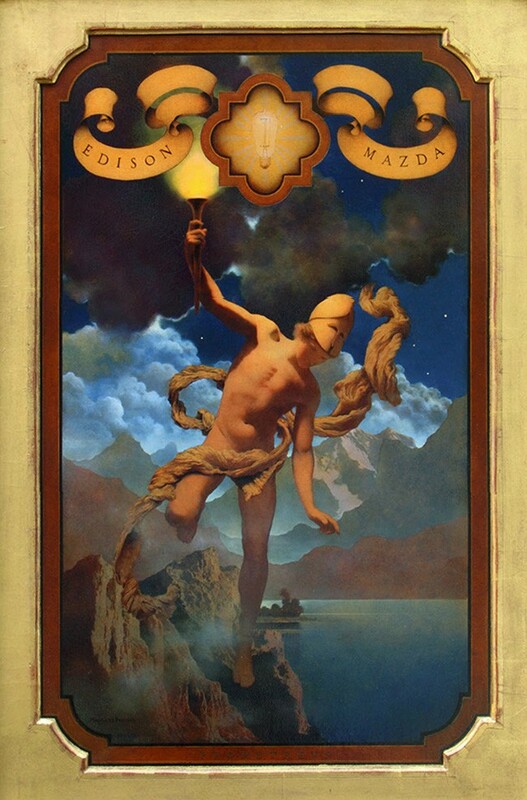 One of the most popular artists during the Golden Age of Illustration, Maxfield Parrish illustrated poetic narratives set in other-worldly landscapes of ancient gnarled trees, tumbling waterfalls, and azure skies, painted with precision and dreamlike clarity. His incredible popularity was built on the expansion of the print market and the distribution of his imagery for calendars and books of poetry and tales of the fantastic. 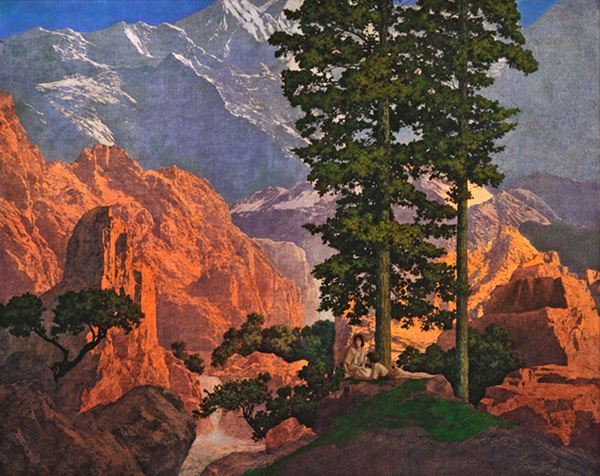 It is estimated that in the 1920s, a quarter of all American households displayed a Parrish print on their walls. For a short time Maxfield Parrish was a student of influential teacher Howard Pyle, who also instructed illustrators N.C. Wyeth, Frank Schoonover, Harvey Dunn, and many others, though he had already undergone a thorough education at the Pennsylvania Academy of Fine Art with Thomas Anshutz and Robert Vonnoh. The solid training both of these teachers had received in Paris ateliers was passed on to Parrish who added his own unique flavor to the make-believe world he would invent in paint. 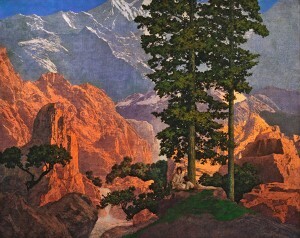 Parrish’s unique paintings were commissioned for book illustrations, magazine story illustrations, building murals, calendars, and commercial advertisements for companies like Colgate, General Electric, and Edison Mazda Lamps. 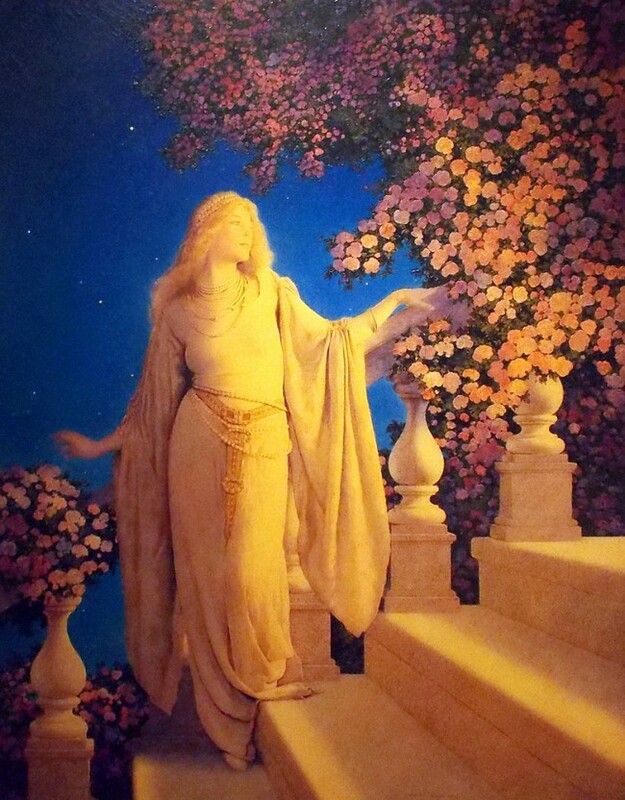 By utliizing bold colors to illustrate fantasy images, Parrish created paintings of great and lasting beauty. 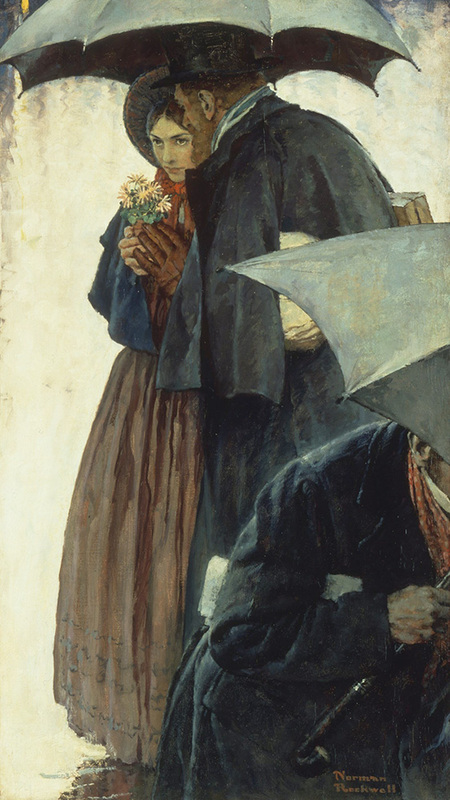 A student of the famed teacher Howard Pyle, N.C. Wyeth is credited with creating over 3,000 paintings and providing illustrations for over 100 books. Wyeth’s first published illustration was for the cover of the February 21, 1903 edition of The Saturday Evening Post. 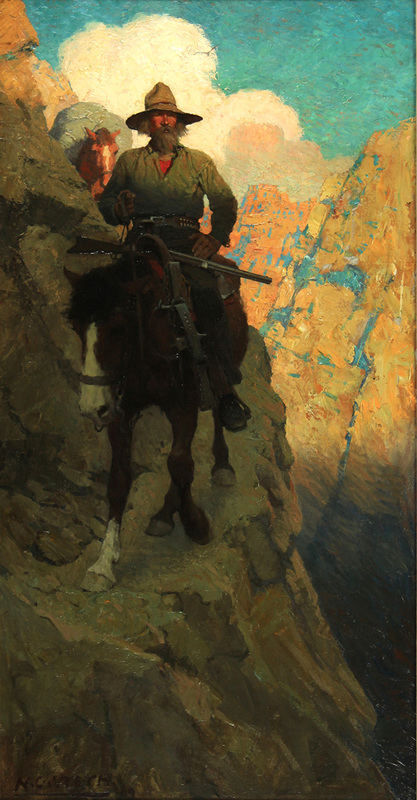 Well known for his paintings of the American West, the painting featured a cowboy riding a bucking bronco. As with many other illustrators of the period, Wyeth created painted advertisements for corporations like Coca-Cola, Lucky Strike, and Kelloggs, and illustrated covers for magazines like Judge, Ladies’ Home Journal, McClure’s, and The Popular Magazine. Wyeth’s lasting popularity lies in his prodigious book illustrations. 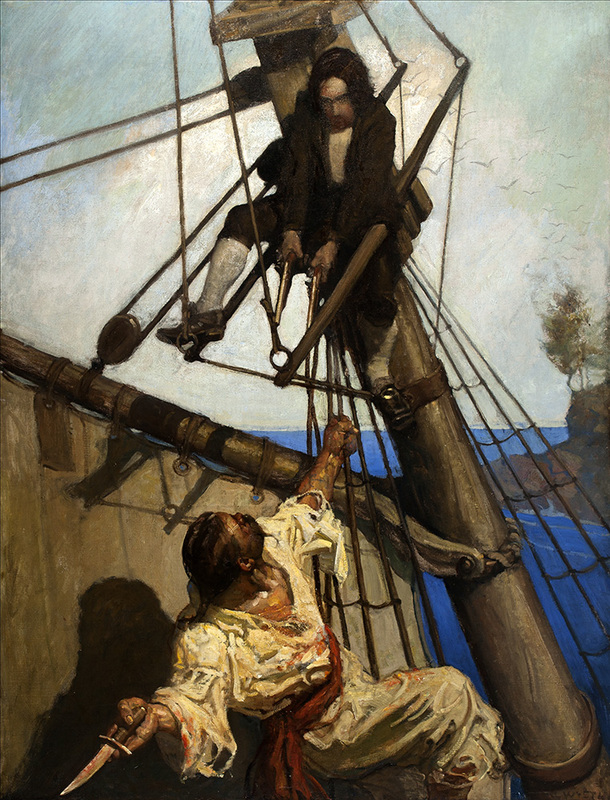 Beginning in 1911, Wyeth illustrated Treasure Island for Charles Sribner’s Sons. The illustrations were immensely popular and Wyeth followed up this achievement with illustrations in several additional adventure books of classic literature including Robin Hood, Rip Van Winkle, The Last of the Mohicans, Robinson Crusoe, Kidnapped, and many others. Born in New York City, Norman Rockwell always wanted to be an artist. At age 14, Rockwell enrolled in art classes at The New York School of Art (formerly The Chase School of Art). Two years later, in 1910, he left high school to study art at The National Academy of Design. He soon transferred to The Art Students League, where he studied with Thomas Fogarty and George Bridgman. 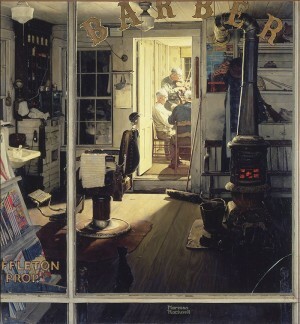 Fogarty’s instruction in illustration prepared Rockwell for his first commercial commissions. 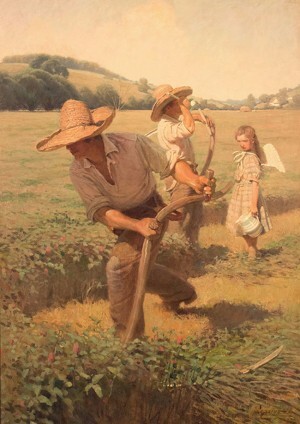 From Bridgman, Rockwell learned the technical skills on which he relied throughout his long career. In 1973, Rockwell established a trust to preserve his artistic legacy by placing his works in the custodianship of the Old Corner House Stockbridge Historical Society, later to become Norman Rockwell Museum at Stockbridge. The trust now forms the core of the Museum’s permanent collections. In 1976, in failing health, Rockwell became concerned about the future of his studio. He arranged to have his studio and its contents added to the trust. In 1977, Rockwell received the nation’s highest civilian honor, the Presidential Medal of Freedom. 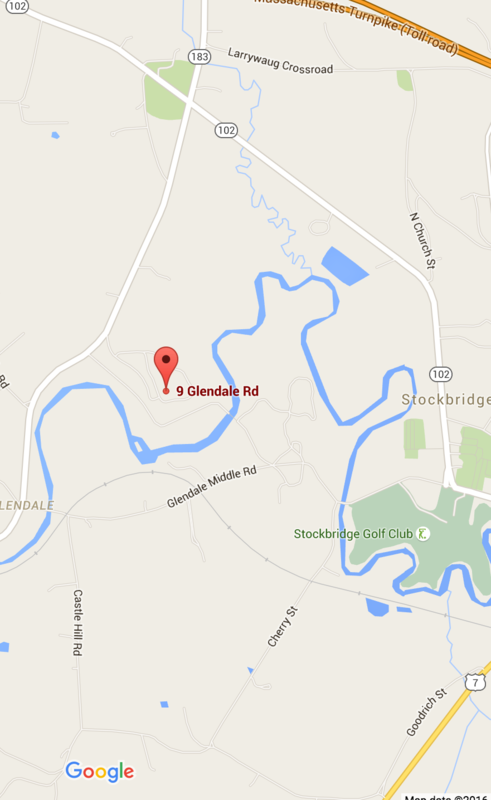 He died peacefully at his home in Stockbridge on November 8, 1978, at the age of 84. Oil on canvas, 62” x 36 ½”. 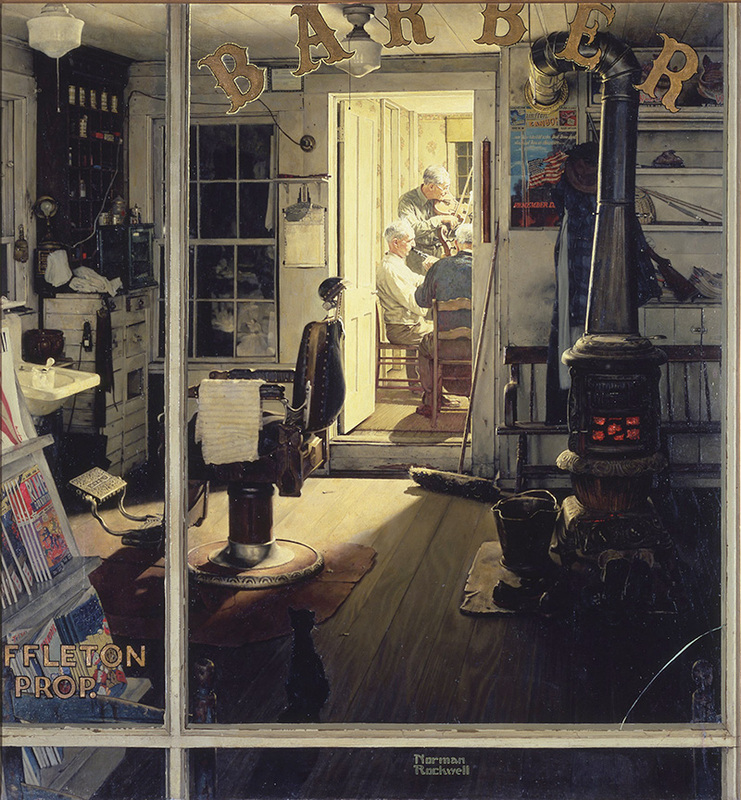 Shuffleton’s Barbershop, Norman Rockwell. 1950. Oil on canvas, 33″x 31″ Cover illustration for The Saturday Evening Post, April 29, 1950. Collection of the Lucas Museum of Narrative Art. ©1950 SEPS: Licensed by Curtis Publishing, Indianapolis, IN. Maxfield Parrish (American, 1870-1966) Solitude, 1911. Oil on board. The Kelly Collection of American Illustration.